The Be Your Best Self Initiative was created by the Division of Student Affairs to celebrate the healthy choices and decisions that the UMBC student body make everyday. When you make good choices, you are in great company at UMBC. Poster and Flyer image to promote the initiative. Took the image, designed and printed indoor poster and quarter cards. Student organizations are created and run by current students and offer a wide array of opportunities to get involved in your campus community through interests and causes you are passionate about. Many organizations serve to enhance your education, and they all add boundless fun and memories to your student experience! Involvement Fest is UMBC students chance to meet and interact with all of the student orgs. Marketing Package for Involvement Fest. Designed logo and t-shirt design, printed indoor banner and poster, brochures, maps and quarter cards. The commonvision staff each created their own postcard design. We used this as a way to market and promote the creativity of our student staff to the UMBC community. We have plenty of these in the office, so stop by and get yourself a couple. Since these are so popular, we change the designs often, so be sure to check by our office often!! Postcards that we had out free to our awesome customers! Designed and printed 4x6 postcards. Each week there are a handful of events on UMBC's campus. We at commonvision take on the task to aiding in promoting these events further than social media through print. 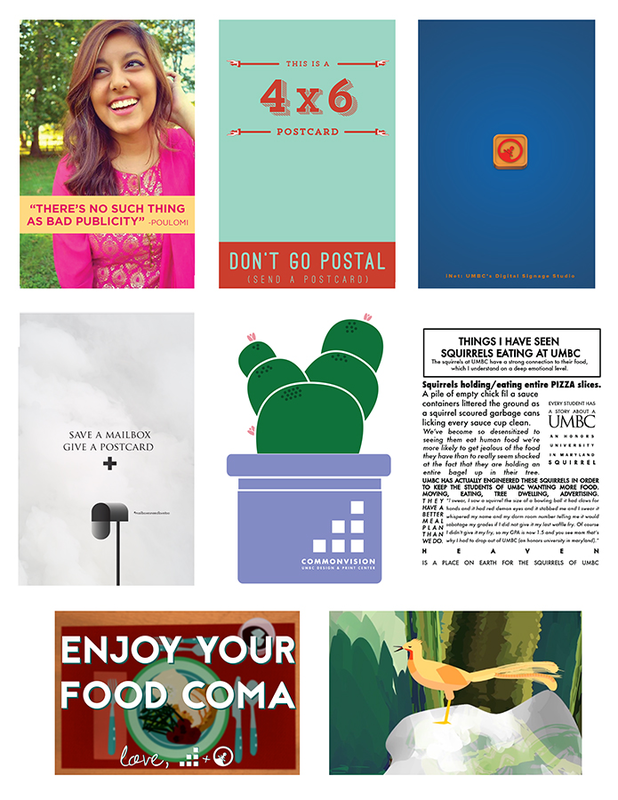 Each month, a designer at commonvision develops a theme and creates a poster for each week. These are just a few of the thousands of posters we have created, one week at a time. Weekly event poster series throughout the semesters. Designed and printed 36x48, 20x30, 25.5x48.5 posters. Green Dot is built on the premise that in order to measurably reduce the perpetration of power-based personal violence (including sexual violence, partner violence, or stalking) a cultural shift is necessary. In order to create a cultural shift, a critical mass of people will need to engage in a new behavior or set of behaviors that will make violence less sustainable within any given community. Poster campaign for Green Dot Bystander Intervention. Designed and printed posters ranging from 36"x48" to 11"x17" hanging posters. Each poster was then translated to a 30 second animation. Each year we design and print the UMBC Student Handbook that can be purchased at the bookstore in the Commons. This handbooks cover theme was Night and Day based around the idea that UMBC never stops going and it's students are always on the move creating a better tomorrow. It features three distinct buildings on campus, from the left, the Performing Arts & Humanities Building, AOK Library, and the Commons. Student Handbook for 2013 - 2014 school year. Designed and illustrated cover, developed page layout and format.